In Trophäen ihrer Exzellenz, photographic objects speak to the complicity between architecture and changing power relations. The exhibition examines the transformation of Johann Wolfgang Goethe-university in Frankfurt from a castle-like citizens’ university of the German Empire to a modernist mass university, which housed the Frankfurt School, to neoliberal “Clusters of Excellence”. 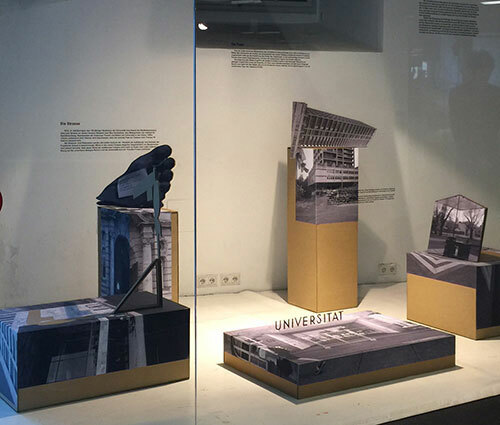 Based on the collaborative research with urban sociologist Klaus Ronneberger, architectural fragments and appropriations of meaning operate as trophies that mark the path to excellence. Trophies here are not only objects, but also images of the architectural and urban processes of appropriation, as well as agents for changing interests and power relations.